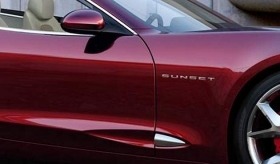 A glimpse of the Fisker Sunset. The production version of the hybrid-powered Karma was pegged to be the centerpiece of the Fisker Automotive at the Detroit auto show. That was, until Tuesday evening. That's when Fisker announced it was bringing a new concept to the Detroit show and gave a peek at it -- a photo that shows the right side of the concept, including the door and front wheel. Prominent on the front quarter panel is the name Sunset. Fisker did not give up any other details about the concept. But the photo also appears the reveal the lack of a B-pillar behind the driver's seat -- which could be a signal that the Sunset is a convertible.